GeoIPAutoUpdater: failed to unzip '/var/www/stat/misc/GeoIPCity.dat.dat.gz' after downloading 'http://geolite.maxmind.com/download/geoip/database/GeoLiteCity.dat.gz': The downloaded file is not a valid GeoIP database. Please re-check the URL or download the file manually. that there is twice .dat in the filename, which maybe indicates an error (or maybe not?) failed to unzip '/var/www/stat/misc/GeoIPCity.dat.dat.gz. ERROR [2016-01-06 00:56:32] /home/piwik-demo/www/demo.piwik.org/plugins/UserCountry/GeoIPAutoUpdater.php(161): GeoIPAutoUpdater: failed to unzip '/home/piwik-demo/www/demo.piwik.org/misc/GeoIPCity.dat.dat.gz' after downloading 'http://geolite.maxmind.com/download/geoip/database/GeoLiteCity.dat.gz': The downloaded file is not a valid GeoIP database. Please re-check the URL or download the file manually. Adding to 2.16.0 - @tsteur @sgiehl maybe you could take a look at this one? It started occuring in November and seems to be experienced by all users. 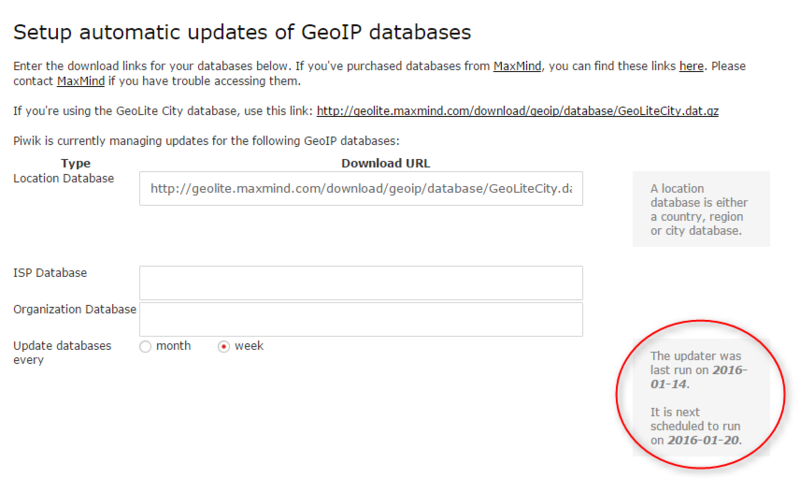 FYI: geoip.loc_db_url in option table in DB says http://geolite.maxmind.com/download/geoip/database/GeoLiteCity.dat.gz on demo. Had a quick look but code is almost impossible to understand so needs proper investigating or refactoring. in our installation (2.16b3) in backend there is no error message visible. => is it ok in this installation (and does not appear everywhere)? => or should one add a error massage to report if there is a problem? ERROR [2016-02-03 00:05:11] /var/www/piwik/plugins/UserCountry/GeoIPAutoUpdater.php(161): GeoIPAutoUpdater: failed to unzip '/var/www/piwik/misc/GeoIPCity.dat.dat.gz' after downloading 'http://geolite.maxmind.com/download/geoip/database/GeoLiteCity.dat.gz': The downloaded file is not a valid GeoIP database. Please re-check the URL or download the file manually. Fails here as well. v2.16.0 on FreeBSD. INFO [2016-07-13 04:59:50] GeoIPAutoUpdater: Encountered PHP error when testing newly downloaded GeoIP database: 2: include(): Failed opening '/var/www/piwik/tmp/cache/tracker/piwikcache_Translations-en-e21bf04aeec884480f77854677fd2bf5fbc090f3.php' for inclusion (include_path='/var/www/piwik/vendor/pear/pear_exception:/var/www/piwik/vendor/pear/console_getopt:/var/www/piwik/vendor/pear/pear-core-minimal/src:/var/www/piwik/vendor/pear/archive_tar:. :/usr/share/php') on line 112 of /var/www/piwik/vendor/doctrine/cache/lib/Doctrine/Common/Cache/PhpFileCache.php. ERROR [2016-07-13 04:59:50] /var/www/piwik/plugins/UserCountry/GeoIPAutoUpdater.php(161): GeoIPAutoUpdater: failed to unzip '/var/www/piwik/misc/GeoIPCity.dat.dat.gz' after downloading 'http://geolite.maxmind.com/download/geoip/database/GeoLiteCity.dat.gz': The downloaded file is not a valid GeoIP database. Please re-check the URL or download the file manually. I currently do not have the piwik knowledge and time to investigate further but maybe this give the right person a hint? Checking your browser before accessing maxmind.com. I've been recently getting the same error. My current error output is for GeoLite2 but I've tried legacy with no success. The URL is giving me a 404 on legacy. Geo2 doesn't work because it doesn't contain a .dat file. "Huzzah! There are no problems with your Matomo setup. Give yourself a pat on the back." ERROR [2019-01-13 11:49:21] 6701  /home/user/public_html/analytics.example.com/plugins/UserCountry/GeoIPAutoUpdater.php(167): GeoIPAutoUpdater: failed to unzip '/home/user/public_html/analytics.example.com/misc/GeoIPCity.dat.tar.gz' after downloading 'https://geolite.maxmind.com/download/geoip/database/GeoLite2-City.tar.gz': Cannot find GeoIPCity.dat file in tar archive '/home/user/public_html/analytics.example.com/misc/GeoIPCity.dat.tar.gz'! ERROR [2019-01-09 11:45:50] 12232  /home/user/public_html/analytics.example.com/plugins/UserCountry/GeoIPAutoUpdater.php(167): GeoIPAutoUpdater: failed to unzip '/home/user/public_html/analytics.example.com/misc/GeoIPCity.dat.dat.gz' after downloading 'http://geolite.maxmind.com/download/geoip/database/GeoLiteCity.dat.gz': The downloaded file is not a valid GeoIP database. Please re-check the URL or download the file manually. New Files has MaxMind Database Format, so no .dat file is included in download. GeoIP Legacy Lite has been announced to be discontinued about a year ago. Since two weeks there are no downloads available anymore. If you wish to use a free database you need to switch to GeoIP 2. To do this you may need to activate the GeoIp2 plugin in Matomo and configured it in the location provider settings.